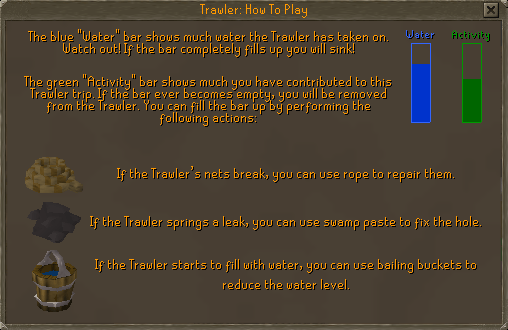 The Fishing Trawler is an exciting, yet relaxing Activity that any player above level 15 Fishing can play. It is a members only Activity. This Activity is a good source to gain Fishing experience. It is the only source of certain "rare" fish, including the Manta Ray and the Sea Turtle. You may play this Activity with friends, in a group or even by yourself! The main world for this Activity is World 116. 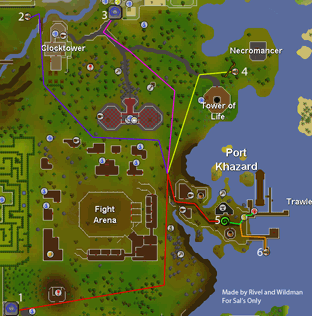 Teleport to the Watchtower with 2 Earth Runes and 2 Law Runes and follow the red line to walk to Port Khazard. Use any Spirit Tree on RuneScape and teleport to the Battlefield. Afterwards, walk to Port Khazard by following the blue line. 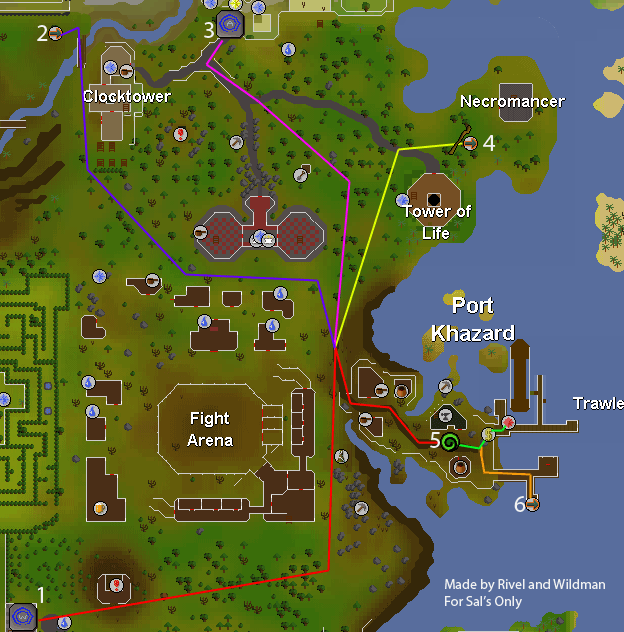 Teleport to Ardougne with 2 Water Runes and 2 Law Runes, then follow the pink line to Port Khazard. Requirements: Must have started Fairy Tale Part II. Use the Fairy Ring Code "DJP" to teleport just north of Port Khazard, and then walk there by following the yellow line. You need a Dramen staff or a Lunar staff to use the fairy rings. Teleport yourself or a group to Port Khazard using the Khazard (Group) Teleport. This teleport will use 2 Astral Runes, 2 Law Runes and 4 or 8 Water Runes and is in the Lunar Spellbook. Follow the green path. 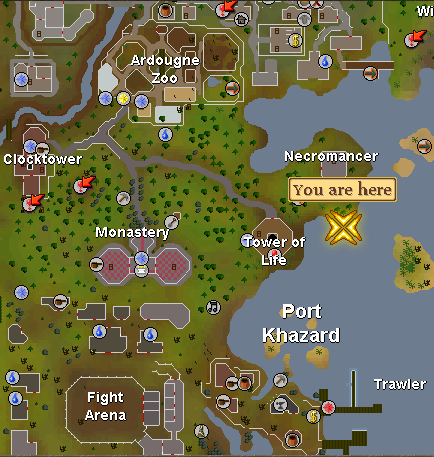 Charter a ship from a place on RuneScape and pay a small fee to be taken to Port Khazard. After, take a small walk to the Activity by following the orange line. The only requirement is that you must have at least level 15 Fishing. The higher your Fishing level, you will catch more fish, and they will be of better quality. In order to go on a fishing trip, you must have supplies to fix your boat. The main items you will need are Bailing Buckets, Ropes and Swamp Paste. 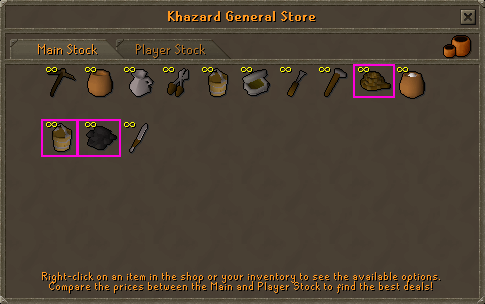 These items can be found in both Port Khazard general stores. However, these items are a little more expensive than what you could get off somewhere else. It is recommended that you buy the supplies at Port Khazard to save some time. 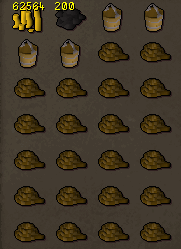 You can get these supplies cheaper by buying them from the Grand Exchange. Wondering what the supplies are needed for? Well, they all have a special role in maintaining the boat so it doesn't sink and giving you a better catch. Rope: Ropes are used to fix the Net. It is recommended that you bring about 20 of them. Without a net, there is no way of catching any fish! When you fix the net with your rope, you won't get it back. Bailing Bucket: Bailing Buckets are used to bail water out of the ship. You must bail out water from your ship if not it will sink. It is recommended to have about 4 of these. Swamp Paste: Swamp Paste is used to patch up holes on the boat and prevent leaks. It is recommended to bring 100-200 of these. When you patch up a hole with your swamp tar, you will lose one swamp tar. What you could also bring are your friends! Friends make the game a lot more fun and increase the chance of success during the Activity. You can organize with them to help you bring the most fish possible. 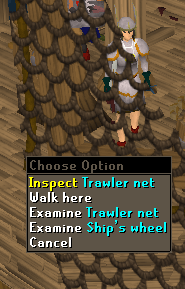 The designated world to play Fishing Trawler is World 116. Here you can find tons of people to play with and to help you succeed. This bar shows you the amount of water that has leaked into the boat. If the whole bar is blue, this means the boat is full of water and it is going to sink. This bar shows how much you do to participate in the Activity. The bar starts out green. However if you don't get active in the game, it will turn orange. Then finally, if you don't participate at all, the bar will run out and you will be booted off the ship. The net should be either OK or Ripped! If it's OK, that means that the net isn't ripped and it is still catching. However if it shows Ripped!, then someone has to fix the net to order to catch more fish. This number shoes how much fish you or your group has caught. This number will then be distributed between your group. This part shows how much time is left before you sail back to port and collect your fish. First of all, speak to Murphy, who runs the Fishing Trawler Activity. He will offer you some advice on how to play. Afterwards, board the boat near him by crossing the gangplank. Wait until the boat leaves. You only have 1 minute to get a chance of getting everyone in if not the boat will leave without some of your friends. While you are sailing at sea, catching some fish, you will encounter some problems with the boat. You have to keep the boat from not sinking for 12 minutes if not you lose. Aboard the boat, you will have to fix nets with rope, patch leaks from the holes on the boat and bail out any water in the boat. Maintaining the 3 will offer you a better chance at success. The boat has 2 floors, the bottom and the upper floors. On the bottom floor, you will see water leaking in and the floor covered in water. To prevent disaster, use the Swamp Paste that you bought on the holes to prevent leaks. 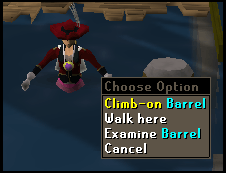 Click on the Bailing Bucket to fill it with water and bail it out of the boat by clicking on it again. On the upper floor, you may find the net. Use rope on the net to fix it. Having a fixed net will allow you to catch fish. There can only be one fishing game at a time. If you miss a game, you must wait until the current fishing game comes back to shore. Everyone on board should do this role if they have nothing else to do. It is essential to not let your boat sink. Bailing needs the use of a Bailing Bucket. This role only need 1 or 2 people. Net Fixers should stock up on ropes. If they have a higher Crafting level, they will have less trouble fixing the net. If the net is OK, they should either wait until the net rips again or they can go downstairs and help out with the bailing. First of all, inspect the net to see if it's ripped or not. This can also be done by looking at the interface. If you see that it is in fact ripped, use a rope with the net or just simply click on the net. When the boat is not filling with water, the crew should concentrate on patching leaks. Patched leaks means that less water will get into your boat. On the bottom deck of the Fishing Trawler, you will see water pouring into the boat through the holes in the hull. Use Swamp Tar on these holes to patch them. After a few moments, however, you will see that your patching was not all that effective, since the water will open up the hole again. If you do not bail out the water in the ship, it will sink. This will result in a failure. Failure means that you get no reward. Failure may not be nice, but you can't just stay in the water. You have to get out of there and back on shore. When you lose the Activity, you will find the ship under water and you, floating in the open. To leave, swim to a barrel and climb onto it. You will then try to swim back to shore with by using the barrel. Another way of failing would be to not get active enough in the Activity that you get booted off the boat. This process of failing only boots you off the ship; the others will continue their journey to catch more fish. Be sure to not let your Activity Bar run out. In either way of failing, you will find yourself near the Tower of Life. If you want to get back to the Activity, it's just a short walk back to Port Khazard. If the lost got into your head and you want to take a break, the choice is yours! If you succeed to keep the ship afloat for 12 minutes, then you win the Activity. Now to get the fish you have been wanting. The long fishing trip will conclude by taking you back to Port Khazard. Afterwards, the ship will put you back on the ports. 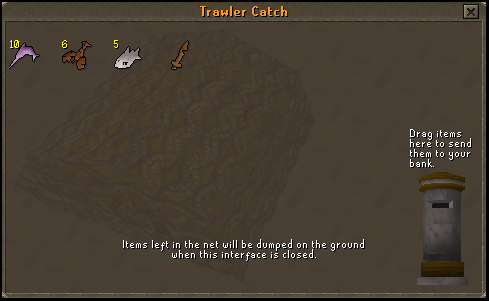 Inspect the Trawler Fishing Net to see what you caught. This is your reward. The rewards are usually all fish. 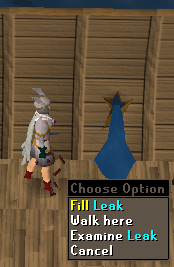 You can also drag the fish in the Trawler Net to the Bank Deposit Box icon to bank them. If not, you can take them and leave. If you successfully complete the Activity, you will receive a reward. The reward is mostly composed of raw fish. 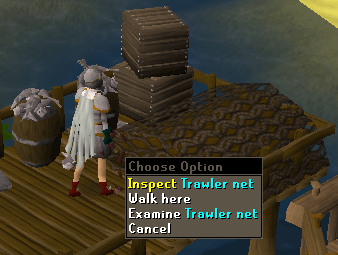 Inspect the Trawler Net to see what you caught. Here are the raw fish you can get during the Activity. The fish need a certain level in order to catch them on the boat. You can also get a maximum of 3 junk per boating trip. The junk may be useful such as Rusty Swords, Damaged Armors, Broken Arrows, etc. These can then be repaired by you. Some junk can also contain no use at all for you.